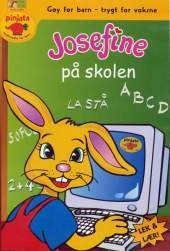 This is another CD-ROM game with bunny Josephine. You get this time to be with her ​​at school and see what she and her friends do there. Print things it might be nice to have when they start school, such as songs and drawings to color. Learn things that have to do with school, about letters, Math, geography and other subjects. The game is ideal for children to start school or who have just started (5-10 years).